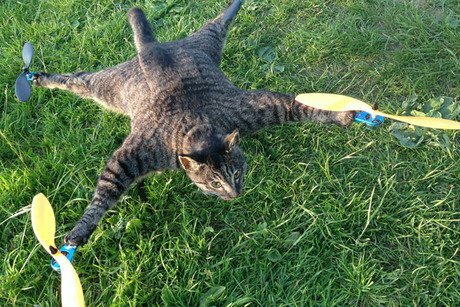 Bart Jansen’s Orvillecopter: A Lotus T580 radio-controlled helicopter and the tanned hide of his cat. Some people love their cats so much that when the animal(s) expire, they have them stuffed so they can still gaze upon their beloved companion. An artist in Amsterdam, however, has taken this concept to a new, shall we say “higher,” level. After Bart Jansen’s cat, named Orville, was killed by a car, the man created the Orvillecopter, which he describes as “half-cat, half-machine” on a YouTube video (see below). Jansen took a Lotus T580 radio-controlled helicopter and stretched Orville’s tanned hide over the top of the craft — almost like a canvas – with a propeller at the end of each paw. The cat was named after Orville Wright, who, along with his brother Wilbur, is credited with building the world’s first successful airplane. If you’re speechless, don’t worry — we are too. Want more? Footage of Orville’s “final test” is also on YouTube.